redkassa_ru:Новое ледовое шоу @plushenkoofficial "Щелкунчик-2" в сопровождении симфонического оркестра! С 22 декабря 2017 по 6 января 2018, Москва, СК "Олимпийский". Билеты по летним ценам на redkassa.ru. ЮБИЛЕЙНОЕ ЛЕДОВОЕ ШОУ ЕВГЕНИЯ ПЛЮЩЕНКО "35"
В ледовом шоу принимают участие: ЕВГЕНИЙ ПЛЮЩЕНКО, а также ЛУЧШИЕ ФИГУРИСТЫ ПЛАНЕТЫ!!! ITNY's annual Benefit Gala and Performance will feature a performance of dancing on ice at Sky Rink, Chelsea Piers and will be followed by cocktails, dinner, awards, silent auction and dessert & dancing at The Lighthouse, Chelsea Piers in NYC. 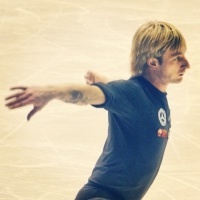 The performance will feature the Company and guest artist two-time Olympic Champion and four-time Olympic Medalist, Evgeni Plushenko. More guest artists are TBD. ITNY will present its Alumni Award to Ari Zakarian and will honor two Ice Angels, Missy VanBuren and Marilyn Kaspoutys (post-humously). Performance starts at 7PM. Festivites follow at about 8PM. lala630312 wrote: Thanks to Natalia! Wonderful news for those in the U.S.
Evgeni will perform in New York, in a special Benefit Gala which will feature performances of dancing on ice. The event will be held at the Sky Rink, Chelsea Piers. Evgeni will be there for the first time, as guest artist. The Ice Theatre of New York will also present its Alumni Award to Ari Zakarian. The Gala will be on October 30, at the Ice Theatre of New York. The performances will start at 7PM and the festivities at 8PM. Celebrating the joy of dancing on ice! Lunch meeting in preparation for the 2017 Gala on October 30. Jirina Ribbens, Ari Zakarian (Alumni Award), George Akst (Co-Chair of the Benefit Gala), Eddie Epstein (Journal writer) and Moira North. We are very excited about honoring Ari. Stay tuned for details on which champions will come to skate in his honor. The show, as always set up at Verona Arena, will be held on two dates: Friday 06.10.2017 at 20.30 and Saturday 07.10.2017 at 20.30. In the cast, besides Evgeni, confirmed for now only the presence of the inevitable Stephane Lambiel and the marvelous Shizuka Arakawa - female Olympic gold in Turin in 2006-. Concept created for the upcoming "Intimissimi on Ice- A Legend of Beauty" on October 6th and 7th at Arena di Verona. A show of emotions that will give you shivers. 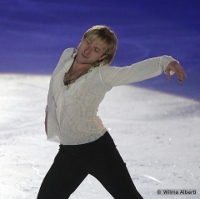 Evgeni will be there to make it even more breathtaking! Возможно, автограф-сессия была позже в Avion Shopping Centre?